Sharing data on the web or a social media such as the Facebook has now become a matter of less thought and more action. Today, where the online data has become subject to increasing security concerns, people still don't hesitate sharing their extremely personal photos or other information on web or social media like Facebook which has also become a kind of cloud storage itself. However, keeping aside the data tracking that we talked earlier in our post, Facebook allows you to restrict other fellow users added in your friends list from viewing the content that you share with your friends. This mean that you should no longer be afraid to accept friend requests from acquaintances that you are reluctant to share any specific or major Facebook content with, be it your boss, parents or that bossy sister who intends to monitor all your social media activities. This is where the restricted list comes to play its part. Lets look into the steps of how to create such a list of people who would not be able to view even all of your public posts, despite being friends on Facebook. 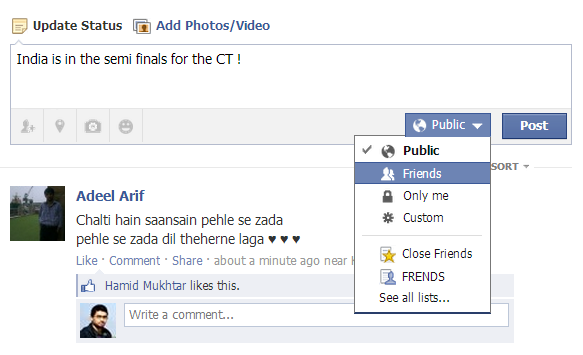 Step #1: Visit the Facebook Profile of the person you want to add to the restricted list. 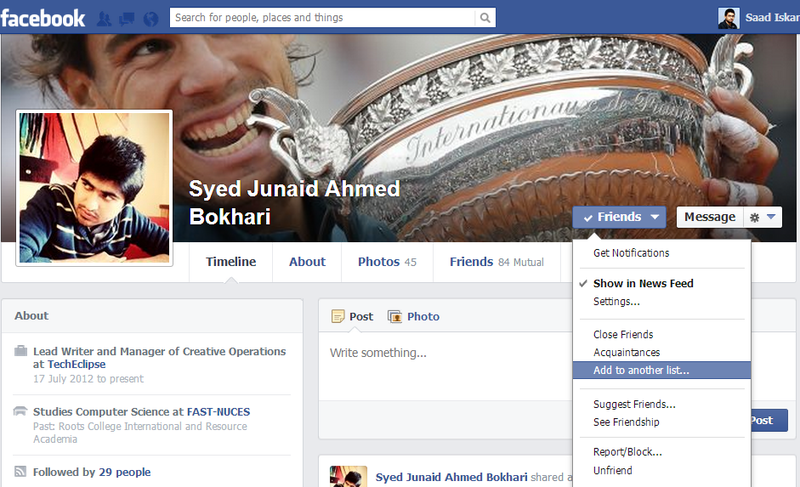 Step #2: Click on the Friends button at the bottom right of the cover photo, residing just beside the Message option. From the drop down menu that appears choose Add to another list as shown in figure 1.0 below. Step #3: From the menu that appears now, click on the Restricted option and put a check mark in front of it. 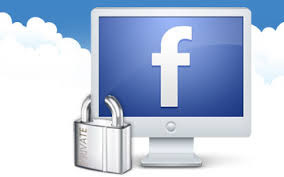 Now you have eradicated all possibilities of your Facebook content being viewed by the person you just filtered into the restricted list, until the post is not public ofcourse. To customize the audience for the content that you share on Facebook, whether it is a status or a photo or anything else, you will need to click on the drop down box that appears at the left side of the Post button, and select the option that suits your content. 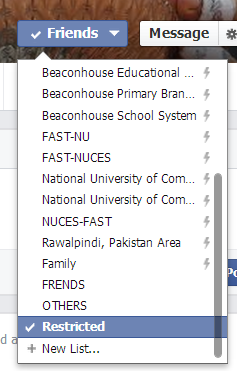 Choosing Friends will make your content visible to your entire Facebook friend zone except the ones you added in the restricted list. However if you choose Public, even the restricted list will be able to view it. Facebook has worked shoulder to shoulder with the privacy issues being reported by its users. They are coming up with ways of securing your content from chosen as well as general audience, just like in this case of making a restricted list out of your Facebook friends. Do you have a restricted list as well?